its bike trails and rightly so. A decent trail bike like a Specialized Stumpjumper or an Intense Carbine like I had are ideal for the type of riding around Fernie. The trails get tight and twisty so I found a 29er can be a bit too much for the better (i.e.steeper) trails. All the trails can be ridden from the historic old town centre and literally every hill has a world class twisitng snake of singletrack awaiting you! If you visit town to browse at the bike shops, pop in to Ski/Bike Base and say hi, it’s the friendliest place in town! Slunt a long sometimes technical trail down from near the top of Mt Fernie. On every Tuesday in the summer, Fernie has the Toonie Tuesday races, basically a time trail down a local trail and Slunt was for me the best race to race down due to its variety and arm pumping vertical height loss. The Castle Mountain trails were also a firm favourite for me, Castle Rocks and Roots especially, they were a good option before work although in the early morning there were frequently bears on the lower section of this trail so make noise go in groups and carry spray! Project 9 or P9 is accessed from the Island Lake Lodge road past the Fernie Provincial Park. It is an epic climb up on steep tracks, the home of many moose and elk. The descent drops down tight through the trees before a super steep chute sends you onto a rough open riverbed section more twisty in the trees and wide open meadow trail awaits lower down, it’s different every summer after the snow melt moves the trail but always good fun! The end of season P9 race is held here, a savage beast of a race, I raced it after a summer of ridng hard and placed 3rd on the climb in a 3 man break-away group. Sadly a rogue, tire piercingly sharp rock put pay to about 30% of the field on the descent, all us in the top three included so we all lost out overall. Then finally the other must do trail is Swine Flu a twisty bermy fun trail down towards the Canadian Tire Centre on the way out of town. For all these routes buy a local bike club map in Ski Base and that will set you up perfectly. 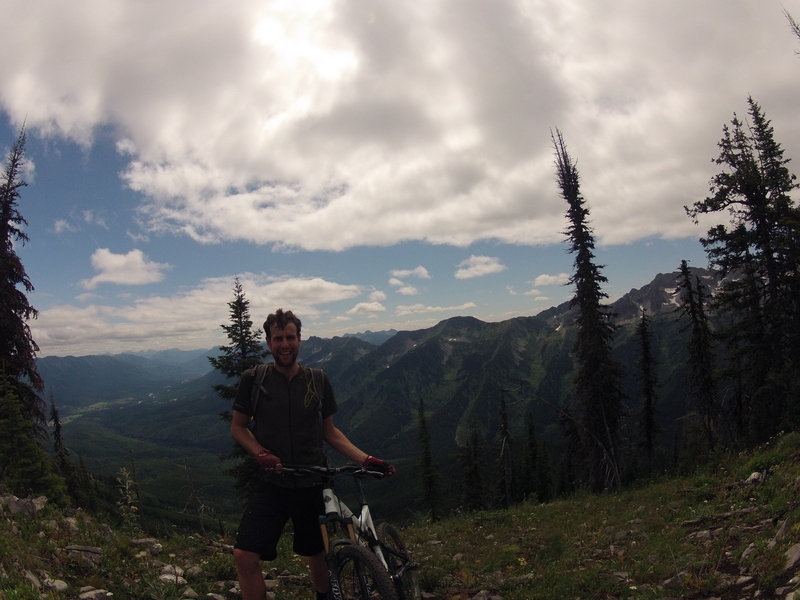 The brightest jewel in Fernie’s crown, is the epic back country biking/walking path called Heiko’s trail a huge undertaking through some incredibly wild areas. As with all trails like this, expect to hike sections where it’s too rough or steep. The path starts from Island Lake lodge then climbs up behind Mt Fernie before passing the iconic three sisters peak and descending to a remote part of the Hartley lake road. The first climb is brutal in either direction, if you thought you were fit this trail will make you think again. We saw 4 bears while riding it, including a mum with 2 cubs actually on the trail, this is proper big country riding, so be prepared and don’t go alone! 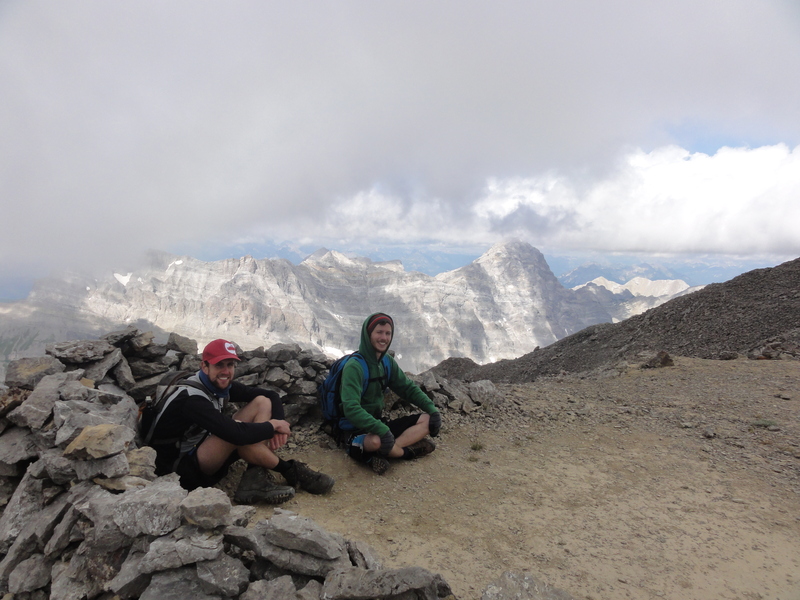 The picture below is at the summit of the first epic climb from Island Lake Lodge, I felt like I would pass out on the last few hairpins, it is the kind of trail where hikers take pictures of the crazy guy on a bike, one man asked me to pose for a picture with his two teenage daughters #awkward. Too much time was spent riding last summer, well you can never say too much, I guess I just mean lots! See the movie below for more of an idea on the trails. 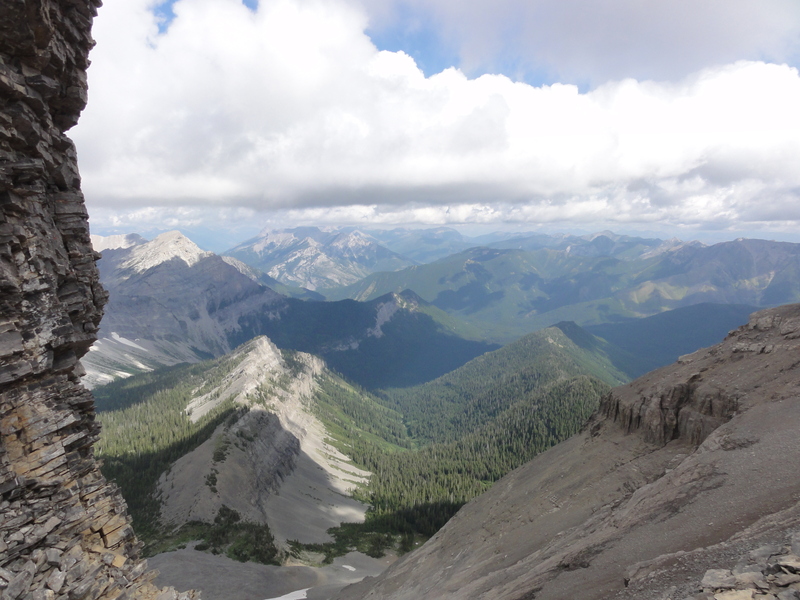 We also explored some hiking options around Fernie places such as Mt Fernie, Mt Proctor and up to the Spineback ridge. Mt Fernie is the obvious summit directly above Fernie and it’s a pretty straight forward hike up. An old track takes you most of the way before the steep final section to the very top. In winter the steep avalanche chutes are skiable but only when the snow is super stable, sadly this isn’t too often. Mt Proctor is the famous peak sitting behind the Ghostrider. The Ghostrider is an eerie shadow cast on the mountain at a certain time of the day, usually mid afternnoon, that looks uncannily like a running horse with a man on top. It has given the local ice hockey team its name as well as a few businesses in the area. 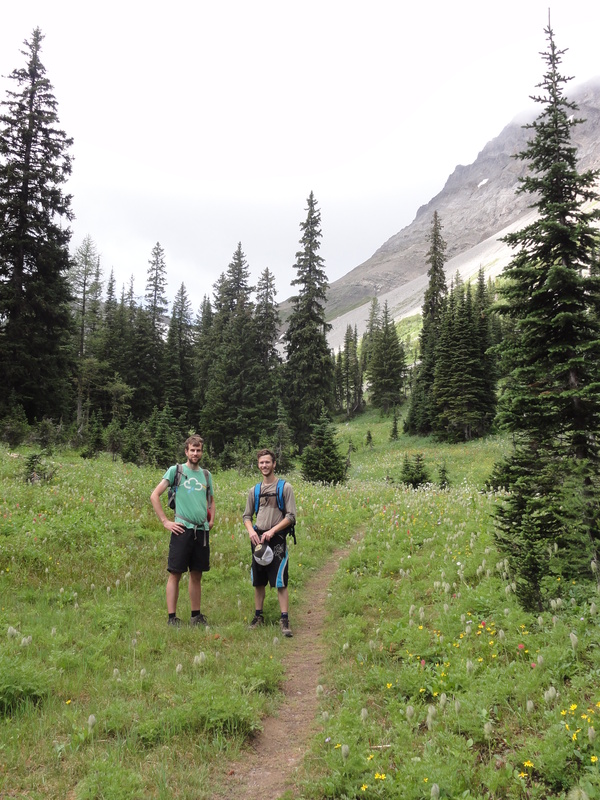 The access point for this hike is a pleasant trail off the Hartley Lake road. A tough road that gets super sketchy in rain or ice! 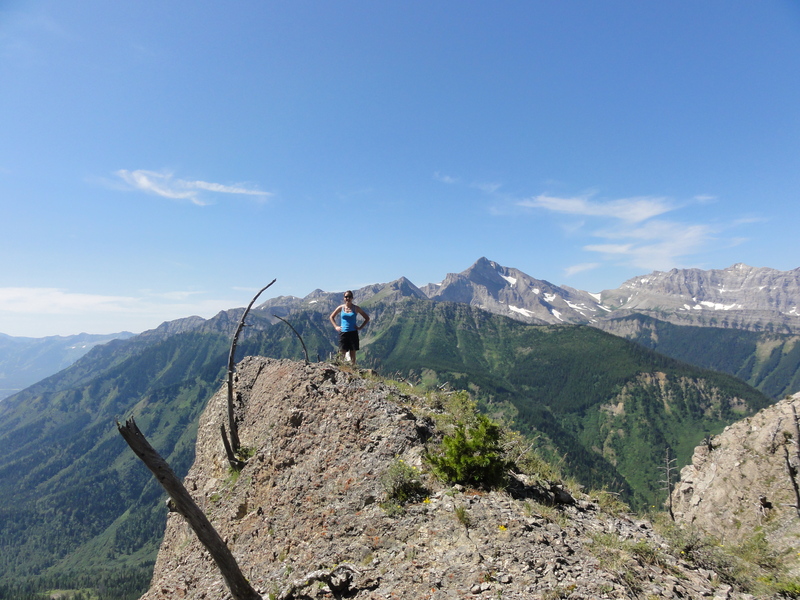 Another great hike is the route up to spine back ridge. A walking path starts from Island lake lodge and its sign posted I think up to the this rocky ridge with great views down the valley. Sitting on top of the Three Sisters regretting the decision to wear shorts this high up. View across the vast wilderness behind Fernie, it really is never ending undiscovered forest and hills! 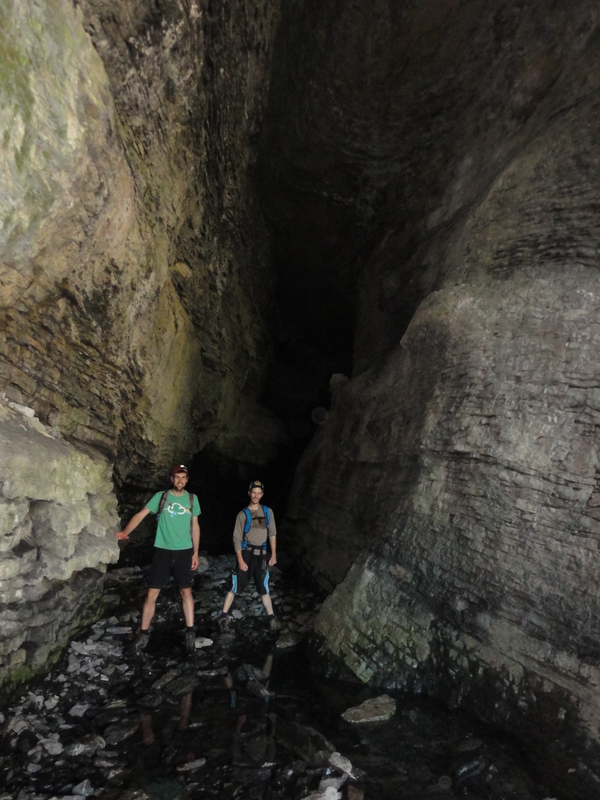 The enormous cave on Heiko’s trail that you can climb and scramble into for a pretty decent distance underground. Bear friendly meadows on Heiko’s trail meant we made a decent amount of noise through here. Especially as last year a big group of hikers was charged by a particularly aggressive bear.